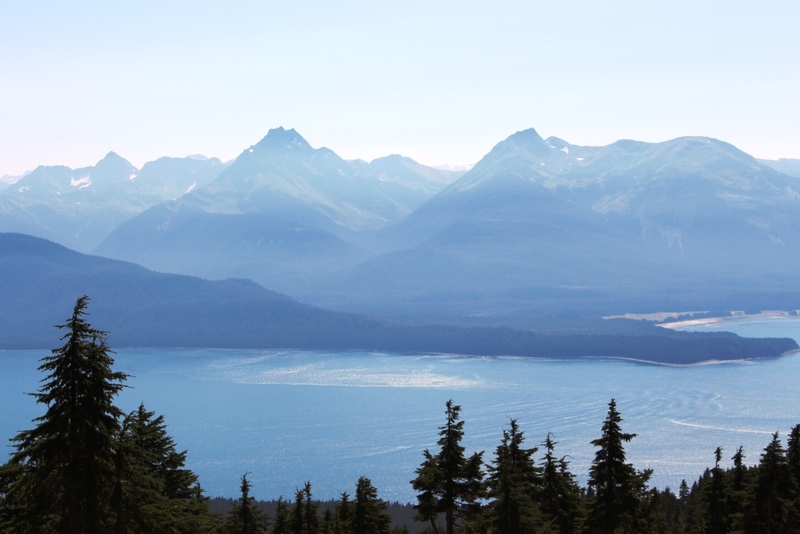 Apologies for missing most of August; I spent ten days gallivanting around Juneau, Alaska with my family, followed closely by a week in Iowa for work. Despite a major rope burn courtesy of my mom’s dog (which is temporarily destroying my half marathon training), it was a wonderful trip and I hope to not go another eight months before visiting again. Having always lived in places that at least had mountains in the distance, the sheer flatness of Iowa is very weird, my brain can’t quite comprehend that there aren’t any mountains anywhere in sight. A very strange experience for this Rocky Mountains girl. 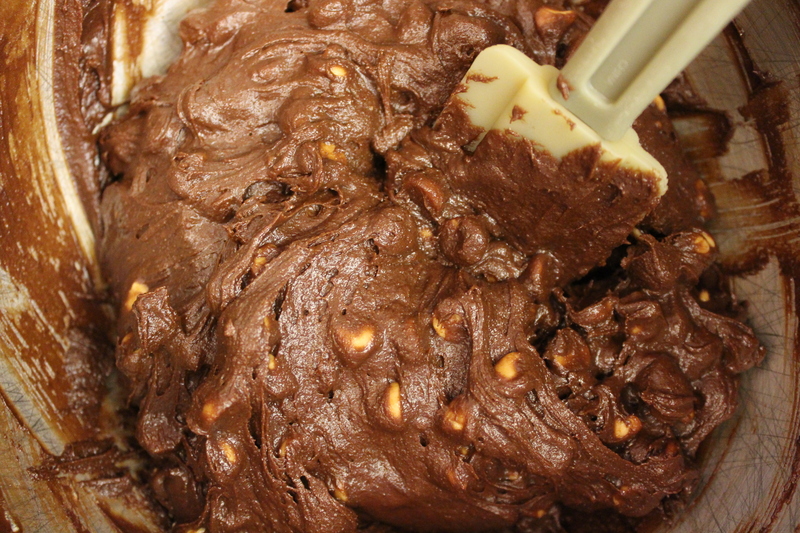 The dough is really more like a brownie batter, and chock-full of peanut butter chips. Chilling time is *required* for these cookies, since you won’t be able to form a ball without it. However, if you chill them too long (say, overnight, as I did), the “dough” becomes ridiculously hard and takes what seems like forever to soften enough for scooping. If you can swing it, check the dough after it’s been in the fridge a half an hour. If it’s firm but still moldable, you’re good go to. If not, check back in another 15 minutes or so. Despite the mildly temperamental dough, these cookies taste amazing. 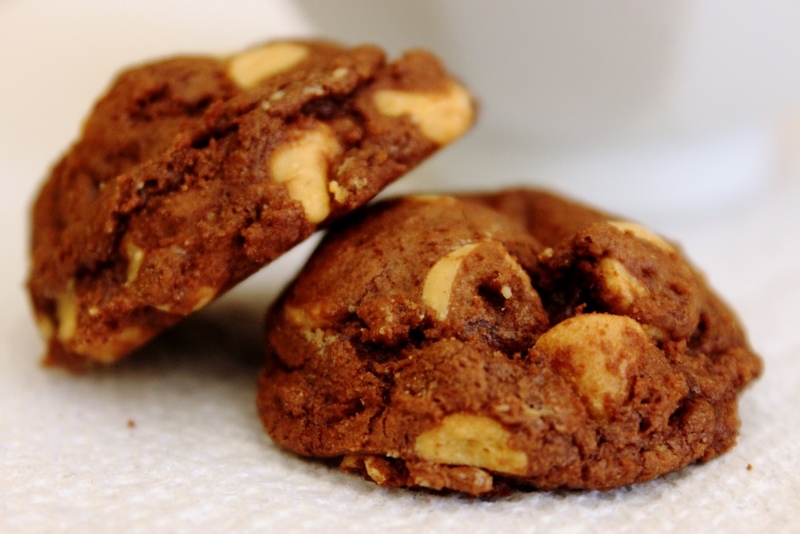 Chocolate and peanut butter is a flavor combination that rarely goes wrong, and these cookies are no exception. Rich, soft, and chocolatey, they seem more like a brownie in a cookie shape than your typical chocolate cookie. Peanut butter chips seemed like the natural pairing to me, but feel free to substitute whatever you like. I’ll likely try mint chips sometime in the future. 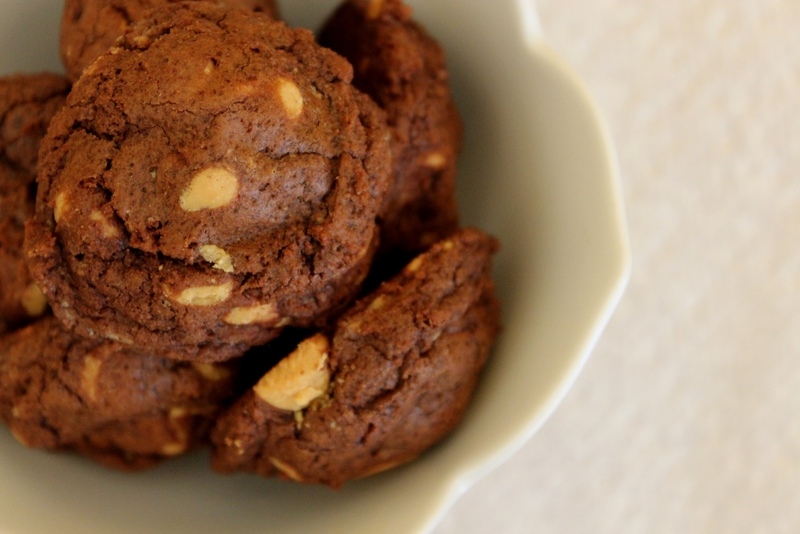 So if you have some time, some peanut butter chips, and a chocolate craving, give these cookies a shot. I guarantee they won’t disappoint. Melt the chocolate for 30 seconds in the microwave, stir. Repeat until chocolate is completely smooth (about 90 seconds total). Set aside. Whisk together flour, cocoa powder, baking powder and salt in a small bowl. Set aside. Lightly whisk together the eggs and vanilla in another small bowl. Set aside. Using an electric mixer, beat the butter on medium-high speed until smooth and fluffy. Add eggs and vanilla and mix until combined. Beat in the chocolate. On slow speed, mix in the dry ingredients. Fold in the peanut butter chips, being careful not to over mix. It should look like delicious brownie batter at this point. Chill dough until firm but moldable; at least 30 minutes. Bake for about 8 minutes, or until cookies are matte in color but still very soft. Cool on the baking sheet for at least 5 minutes, and then transfer to a wire rack to cool completely. If they are cool enough, you shouldn’t need a spatula for the transfer. Enjoy a handful with a tall glass of milk. 1 This is my favorite Kitchen Aid paddle attachment. It is seriously the best thing ever. 2 These cookies barely spread. I could very comfortably fit 15 on a sheet instead of the usual 12. 3 I almost always bake small cookies because I like to be able to eat a lot of them. This particular recipe is quite rich, so I think they work well in the small size. However, if you prefer a more substantial snack, roll 2 Tbsp of dough into a ball, flatten slightly onto the cookie sheet, and bake for approximately 11 minutes. At this size, the recipe will yield just over two dozen cookies.